Despite looking like it could mount a three-goal comeback, the Chilean national team suffered a surprising loss Friday night in Rancagua to an upstart Costa Rican side 3-2. 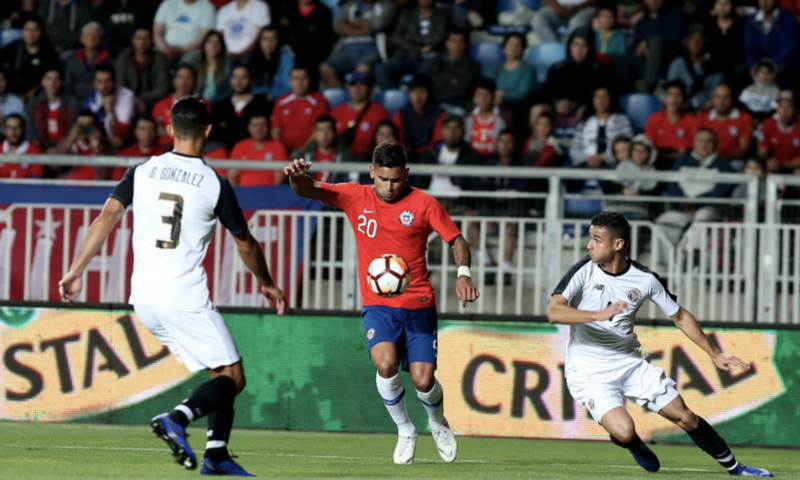 Two late goals had Chile looking like it could tie, but a missed penalty kick from star Alexís Sánchez in the 82nd minute doomed La Roja’s fates. Though Chile dominated in terms of possession and passing, Costa Rica looked like the better side from the start. In the 29th minute, a brilliant spell of passing in the midfield led to a golden opportunity for the Central American side as Allan Cruz had the defender beat, but he sailed the ball high above goal. Los Ticos drew first blood in the 36th minute when central back Kendall Waston found space in the box off a corner kick to send a decisive header into goal. The tall and burly defender gave Chile fits all night off set pieces. Later, in the 59th minute, it was again Waston who fortuitously found another corner kick right in front of his feet and booted it home with his right leg. Costa Rica would then put a third unanswered goal on a shocked Chile side minutes later when left-winger Ronald Matarrita received a perfect lob in front of a pair of Chilean defenders. The young defender didn’t miss his chance as he put it right over goalie Johnny Herrera. Chile mounted its response in the 70th minute when Sebastián Vegas was true on La Roja’s first point of the night. In the 82nd minute though, Sánchez had a great chance to get a result for the Chileans with his penalty kick try. The team’s all-time leading goalscorer put it to the right of center and Tico keeper Esteban Alvarado guessed correctly, saving the ball with his feet. Sánchez would later score after battling defenders to a ball in the box and sending home a gorgeous goal to make it 3-2 in the 90th minute. It was too little, too late for Chile, however, as its first home game since World Cup Qualifiers turned into a disappointment. La Roja will get another shot at getting a win for its home crowd when it faces Honduras in Temuco on Tuesday.